It's said that home is where the heart is. For Jorey Dorsey, her heart - and a new home under construction now - are in New Orleans. "Home is where your roots are, it's where your heritage is," Dorsey said. "So I came home." CBS News correspondent Mark Strassman reports that more than 100,000 people in Metro New Orleans never came back. But most did. According to one recent study there are 50,000 abandoned houses in the city - that's more than a quarter of all homes in New Orleans. But many are uninhabitable. A barge landed on top of the Dorsey family's home when Hurricane Katrina caused New Orleans' levees to break. It took five years, but they're back. Much of the rebuilding around New Orleans has been led by volunteer groups. 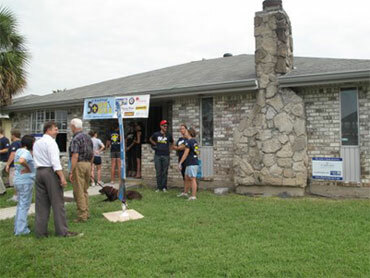 The St. Bernard Project uses AmeriCorps volunteers from around the country to rebuild houses that were ravaged by Katrina. They've rebuilt about 300 homes so far. Five years later, the organization still has a waiting list of almost 200 families wanting to move back home. The St. Bernard Project launched a 50-hour rebuild that will have the Dorseys moving into their home by the end of the weekend. Denise Alexander, a young AmeriCorps volunteer from California, said there's still a need here. "I don't think anybody should stop volunteering, and I don't think people will," she told CBS News correspondent Cami McCormick. Denise Thornton founded another community group called the Beacon of Hope Resource Center, after rebuilding her home following Katrina. The group has helped rebuild 1,700 homes. She said she's a different person than she was five years ago. "I'm more compassionate, I'm more giving, I'm more tolerant," she told Strassman. "I know I have to make a difference. I can't just write a check."